KO for the mobile web ? In a widely circulated piece last week entitled The Decline of the Mobile Web, Chris Dixon touches on a fashionable debate that suggests that the mobile web is in, well, decline, at the hands of the new walled gardens known as the app stores. In other words, that universal cycle of life that has been omnipresent in IT systems — client vs. server, local vs. cloud, native vs. web-based, etc. — is permanently knocked out of kilter. Over 80% of time spent on mobile devices is spent on native apps (86% in 2014 according to forecasts by Flurry). 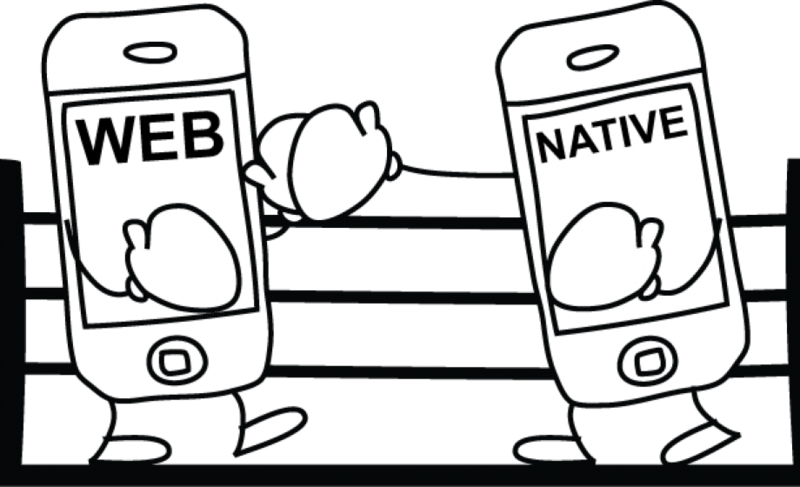 Web companies value native app users more than mobile web users. Scarce development resources are allocated in priority to improving native apps rather than to fixing clunky mobile web user experiences. The duopolistic control of the app stores and their self-reinforcing spiral for the lucky few apps that are highly ranked will slow long-term innovation. The arguments for the mobile web’s inexorable decline are well thought-through and convincing. Smart people agree. Some are even shifting their hopes for innovation to the blockchain (which I won’t pretend to claim I fully grasp). I cannot disagree with the analysis, nor can I muster the intellectual horsepower to craft compelling objections to the conclusion that innovation might suffer. But something is gnawing at me that prevents me from accepting the decline of the mobile web as a foregone conclusion just yet. I may well be naively in denial, and time will prove me wrong one day. That gnawing feeling stems from my respect for that transcendental concept of duality. Herman Hesse couldn’t have portrayed his literary character Goldmund without completing him with Narcissus (there’s no Yin without Yang, in other words). Open standards like HTML5 keep me enthusiastic, especially as services that improve discoverability of HTML5 ‘apps’ continue to emerge. So I’m not ready to call curtains on the mobile web just yet. This debate annoys me so much! The people making it NEVER seem to consider “small business” owners. Do they think every single business on the planet is going to have a mobile application? And even if they (idiotically) say “yes,” how in the hell would anyone ever find anything in the app stores? Their will be BOTH in the future. Now, can we stop having this discussion? Sheesh! I think you should look at hybrid HTML5 cross platform solution like Padify which do not make the debate about either or, but rather both. At a recent travel conference, Air France’s mobile boss shared that their tablet traffic is 90% web and 10% app. Basically people are using the tablet’s browser from their couch instead of walking to (and powering up) a laptop. I would not discount mobile web at all. I would love to get my hands on this info anywhere it has been officially published. It seems very much in line with my own anecdotal evidence. Thanks!